Report: China Spends An Estimated $362.1 Billion On Foreign Aid ... But On What? : Goats and Soda More than 100 researchers spent five years poring over documents to come up with data about how much is spent — and on what. 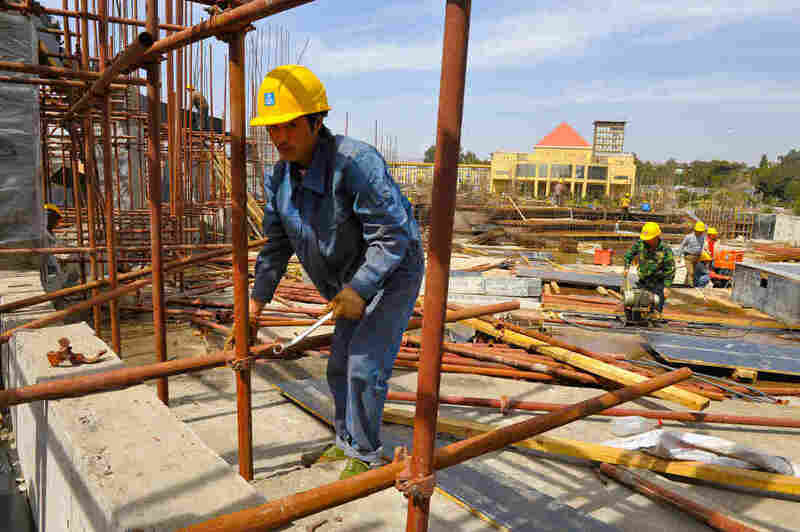 Workers from a Chinese engineering company erect the African Union conference center in Addis Ababa, Ethiopia, in 2010. China paid for the $200 million building as a gift to African Union. For a long time, China's foreign aid spending was best described in the words of Winston Churchill: "a riddle, wrapped in a mystery, inside an enigma." The country withholds information from the public because it is considered a state secret. China joins countries like Saudi Arabia, Iran and Venezuela who collectively spend billions of dollars on overseas development each year but provide little to no information about where the money goes. A new report lifts the shroud of secrecy. What did we learn about Chinese development spending? The report, published by AidData a research lab based at the College of William & Mary, finds that China spent $354.3 billion over the 15-year period from 2000 to 2014 — a figure approaching the $394.6 billion spent by the U.S. over that same time frame. In fact, China now outspends the U.S. on an annual basis. The new data shows that Chinese funds went to more than 4,300 projects in 140 countries and territories. The countries that benefit the most from China's aid vary geographically. Angola, Pakistan and Russia got the most money over the 15-year period. Most of that money was directed toward private sector investments and loan agreements. For example, the China Exim Bank extended $11.5 billion in loans to the Angolan government between 2000 and 2014. Russia and Angola top the list because they are oil-rich countries and important trade partners with China. Pakistan shares a border with China and is an important economic partner that provides geographic access to more countries in the Middle East and Asia. Just 22 percent of the total was spent on official development assistance (ODA), a technical name for what is generally called "foreign aid." As a point of comparison, roughly 93 percent of U.S. overseas development spending counts as ODA. ODA funds go to support humanitarian programs including food aid, access to AIDS drugs and support for smallholder farmers and also take the form of heavily discounted loans to governments and businesses that are at below-market interest rates and/or include long grace periods for repayment. Most Chinese ODA went to African countries, with the continent responsible for seven of the top 10 recipients. Cuba received the most aid money over the time analyzed, taking in $6.7 billion. It is followed by Cote d'Ivoire ($4 billion), Ethiopia ($3.7 billion) and Cameroon ($3.6 billion). The African continent interests China due to its mineral wealth. Where do these numbers come from if all the data is hidden? More than 100 researchers around the world painstakingly analyzed public information, from news reports to government reports, to determine how much money China spent on overseas development projects between 2000 and 2014. AidData developed a new method to find out where and how countries spend money called Tracking Underreported Financial Flows, or TUFF. It involves scanning open source and public documents, including reports published by diplomatic offices, news reports and recipient government budgets to find relevant data. A large amount of the work was done by hand, which is why it took the team five years to collect all the data. Now, much of the work is done by artificial intelligence programs to analyze thousands of pages of documents and websites for new spending figures. The resulting data are to some extent an educated guess at how much money China spends and where it goes. That is because a lot of the figures are based on planned spending, not final costs. But projects do not always cost as much as expected or circumstances change leading to a project to end early. In some cases it is possible that projects never took place at all. A debate over Chinese foreign aid has grown despite the lack of knowledge about how the country spends. The opaque nature of Chinese development spending led critics to label the country a "rogue" donor, charging that the so-called foreign aid money has gone to fund shoddy projects in undemocratic countries. It also fueled concerns that China's increased investments in Africa compete with the U.S. The data helps bring some clarity to China's development spending. On a basic level, it proves the claims that China is increasingly investing in the development of other countries. Its spending grew from $2.6 billion in 2000 to $69.6 billion in 2009. The increased spending correlates with the launch of major development projects in recent years. One example is an ambitious initiative started four years ago to connect China to Europe by assisting the economic development of the countries located in between. The "One Belt, One Road" project, as it is called, is a sort of revitalization of the old Silk Road that enabled trade centuries ago by supporting countries in southeast Asia, central Asia and east Africa. China's plan is to support the development of countries along the route and improve their infrastructure in order to improve trade with Europe. Last year, the country also helped launch a new bank to help low- and middle-income countries pay for infrastructure improvements, like new roads and power lines to rural villages. China enlisted the help of other emerging economies, including Brazil and South Africa, to establish a development bank of their own, similar to the World Bank and IMF. And it is increasingly investing in African countries through aid, loans and direct investment. Because China does not publish its spending data, it is hard to know what these multi-billion dollar initiatives are doing. Are China's investments having an impact? A new working paper released by AidData alongside the data set finds that China's ODA programs have positive impacts on economic growth. The researchers found that a country's economic growth increased by a 0.7 percentage point for every additional Chinese-financed project. It is in line with other research showing the positive economic impact of aid from the U.S. and other countries that are part of the Organization for Economic Co-operation and Development, say the authors. On the other hand, when China's money is, for example, invested in a Russian business, there is no evidence of an economic boost to the country. These other official flows represent a myriad of loans and investments that do not qualify as aid. "In theory, China might have a greater positive impact on growth in the developing world if more of its official financing was in the form of ODA rather than other official flows," said Austin Strange, a Ph.D. student at Harvard University and co-author of the study. And how does this report affect the image of China as a rogue donor? David Dollar of the Brooking Institute analyzed spending between 2012 and 2014 using the new data. Some of the top recipient countries did not fall along the expected "One Belt, One Road" project route, including Venezuela and Nigeria. It shows that China is responding to the needs of countries who request aid to support things like infrastructure to education. What stands out most to him is the fact that China is not necessarily propping up undemocratic regimes. Recent lending does not discriminate based on the recipient countries' governance. It supports his argument that the decisions by China are based significantly on which countries want the money, not necessarily where China wants to invest. He concludes that China is meeting the demands of recipient countries. For example, providing loans and aid to countries that need money to pay for infrastructure projects, like building roads. The lack of money available for infrastructure is a growing problem in sub-Saharan Africa, said a recent World Bank report. Countries do not spend enough and foreign investments do not fill the gap — infrastructure is not a priority area for other major donors like the U.S. The Bank estimates that improving access to and the quality of infrastructure in the region could boost GDP per capita by 2.6 percent per year. "This new evidence punctures the myth that China is a rogue donor," argues Bradley Parks, executive director of AidData. "There is a belief that China is a sort of inferior donor who prioritizes speed over quality leading to poor projects and low impact. That may be individually true, but if that was systematically true we would expect Chinese aid projects to show less impact than Western aid donors." The report shows that is not the case. Evidence is mixed on the general impact of ODA on developing countries, but it generally points to improved economic gains. The analysis of Chinese ODA shows it is in line with the rest of the world, in terms of economic impact. Great, so now we know everything about Chinese development spending, right? It is hard to know precisely because China is not publishing its own data. The estimates in the report rely on information about planned spending and not what was actually spent, points out Dollar. The only official information comes from white papers that describe top-line spending without detailing how much money goes to what country and for what purpose. And there are still criticisms about the quality of Chinese-funded projects. In one case, workers at a Chinese-run mine in Zambia protested poor working conditions enabled by corrupt business dealings. It is difficult to monitor projects without knowing that they exist or how much money is spent. Both Dollar and Parks hope that the publication of the data will encourage China to publish accounts of its spending. There is "a real hunger among Chinese technocrats" to have this data to do their job, Parks says. In the meantime, the AidData team will continue to try and track Chinese development spending and publish it so researchers can study the country's spending habits and try to measure its various impacts. Editor's note: Figures for China's foreign aid and U.S. foreign aid from 2000 to 2014, for loans from the China Exim Bank and aid to Zimbabwe have been updated. Tom Murphy is a journalist focused on foreign aid and development. His work has appeared in Foreign Policy, GlobalPost, Humanosphere and the Guardian. Tweet him @viewfromthecave.